I’m still in love with my Crisper. I especially love crisping polenta with cheese on it to make “fries” or as an alternative to starchy sides. If I want to crisp my polenta (instead of making the creamy, pfizer mashed-potato kind), valeologist I use the store-bought version that comes in a tube, which I’ll either slice into rounds like I did in this recipe or cut into smaller fry-like sticks. Both are equally delicious. The fries go best with fried eggs, sandwiches or a big bowl of homemade chili. The rounds are tastiest when topped with yummy goodness. In this case, caramelized onions and sausage with heirloom tomatoes and arugula. The whole thing came together in about 30 minutes. It was cheesy and spicy, sweet and salty and had a great textural contrast. Heat a large heavy-bottomed pan on medium-high and slice the onions very thin. Once the pan is hot, add the oil and then the onions. Sautee for about 2 – 3 minutes, then begin adding the water a little bit at a time. Continue until you use all of the water or until the onions are translucent, about 8 minutes. Add the sugar, chili powder and salt and continue to cook until the sugar has melted and browned a bit, or another 5 minutes. Preheat the oven’s broiler to 450°. Slice the polenta into rounds about 3/4-inch thick and place onto a cookie sheet. Sprinkle each round evenly with Parmesan cheese. Broil for 10 – 15 minutes or until cheese is melted and slighty browned. In the meantime, sautee the sausages. For this meal, I used the same pan I caramelized the onions in. Add the sausages to a medium-hot pan and cook until they are brown and crispy. Next add the diced tomatoes and stock and cook for 1 minute. Finally, add the arugula and toss briefly until it wilts. 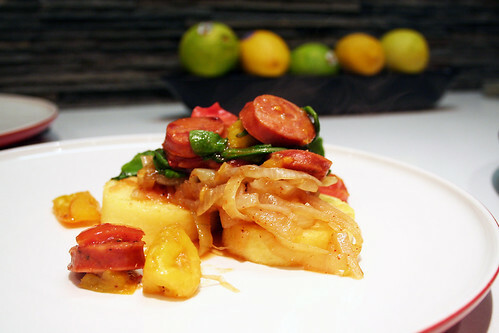 To serve, place 3 polenta rounds on a plate. Add a layer of caramelized onions and spoon the sausage mixture over them.